I have been living with Evernote and OneNote for quite some time. They are both very good at what they do but neither one fully supports my needs. Here are some of my thoughts about choosing between Evernote and OneNote. The main reason I use both is that the note editor/note creation experience in OneNote is outstanding and that the automation features and unstructured information storage features/search features are very good in Evernote. 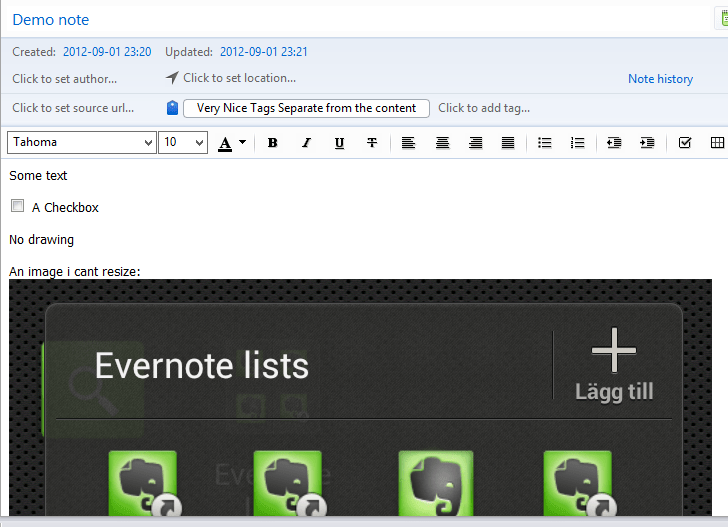 Evernote has one of the poorest featured editing environments I have ever seen outside a text editor. Sometimes when I paste some text with embedded formatting, I end up with such a poorly formatted note that I need to start over. It is impossible to edit the formatting apart from the most basic of html formats. Compared to OneNote, that has an extremely rich editing environment, Evernote feels 20 years to old. If I paste an image in an Evernote note I am unable to scale it to fit my screen or my note. If I paste it in to OneNote I can format and move it around as much as I want. From an editing perspective its like night and day and its is the main reason I still use OneNote to capture notes in meetings. Image above: Evernotes editor with plenty of potential for improvement. OneNote’s integration into the rest of the Office environment is very good. When I use Office I can directly create notes from appointments and have a very rich environment for note taking including links to attendees, agenda etc. 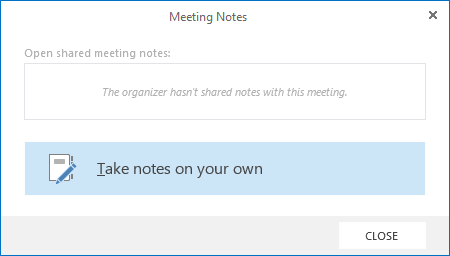 You can even share notes as an event organizer. There is an Outlook plugin for Evernote that made it easy to transfer information to Evernote but it was more for storing/archiving than for active work. And it doesn’t work with the current preview of Office 2013 so I cant use it at all at the moment. The Evernote 3rd party integration to Google calendar etc are as poor as the general editing environment. OneNote is a very structured storage container for notes. You create notebooks, in them you create sections and in them you create pages. You can create page hierarchies for more complex scenarios, but they are always stored in their hierarchies. very good for storing highly ordered information such as managing project notes etc. You can create and work with tags integrated in the notes in a very advanced way but its not as easy to use them to find diverse information as it is in Evernote. Image Above: Saved searches in Evernote. Evernote has very limited structured options. You create notebooks that can be placed in one level of stacks. In the Notebook you store your notes. No hierarchies to be found. Evernote organizes content by search and by tags. By saving searches you create your own view of your information. Since I like to store lists and to-do’s etc. in separate items I find it easier for me to find and manipulate my information in Evernote at the moment. A nice touch is that my saved searches from my PC appears in the mobile app as well. I currently use an HTC One X mobile phone and with Evernote I can create links to custom saved searches directly to Icons I can have on my start screen. This means I can tap one icon and find all my current to-do’s for work without even starting the application. I can also search all my information as I please, including OCR’d text from .pdf’s or scanned documents. OneNotes mobile application doesn’t support search at all so you really need to have your information structured to find it. (To be fair, OneNote supports OCR at the client so you can search at your PC. Evernote will OCR in the cloud so you can also find information that has been added through services). Above: Screenshot of my mobile Evernote list collection (Android). direct access to the family grocery list as well as my to do list at home and at work. If you are a widget type of person, note that there are widgets for Evernote but not for OneNote . There are quite a few options to integrate online services with Evernote (such as Wappwolf and IFTTT). I still haven’t found a single one that works with OneNote. This might improve in the future with Windows 8 and Office 2013, but then again, who knows what will happen tomorrow. In general, both applications will store my information in the cloud and make it available everywhere, in applications, mobile apps and through a web browser interface. They both cost money, I need the Premium version of Evernote that charges by the month and I need the OneNote application that you purchase as part of Office. 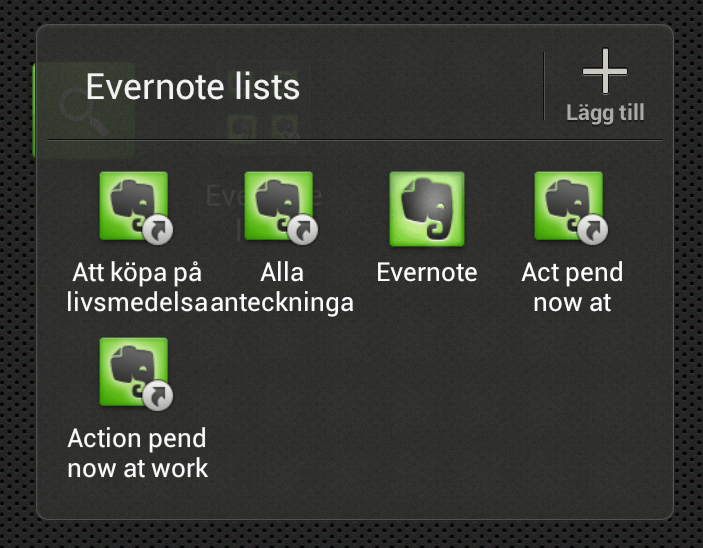 I noticed that the new Android Evernote app also costs SEK40 ($6’ish) if you want to use it with more than 500 notes. Either way I don’t mind paying for what I need and use. Both OneNote and Evernote now support Android. They both work ok and I get access to all my notes. They also both work on Windows Phone 7 and iPhone so when I change phones it shouldn’t matter. The only issue I have is with the OneNote implementation that I wrote about above in regards to finding your stuff. This issue is more on how you store and process your information and how well the app supports your needs. 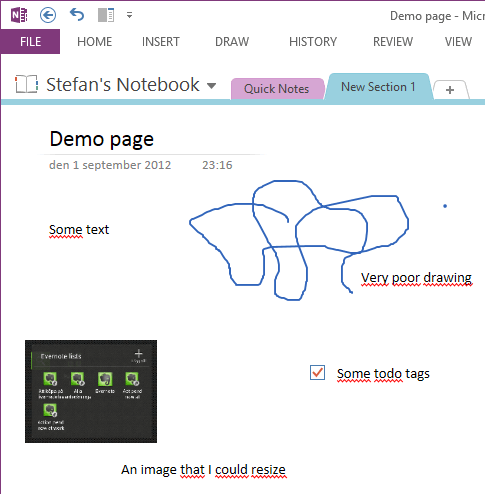 This entry was posted in General and tagged Evernote, Microsoft, OneNote on 2012-09-01, Saturday by Stefan Johansson.